Sakura season – hard to get a hotel? That depends on how fussy you are! This is a post from spring that I have only now managed to find the time to publish. Hopefully my summer postings will be more timely! 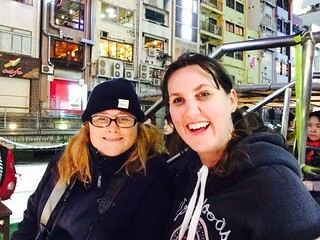 When Kate arrived, I suddenly remembered that I had promised to book accommodation for us in Osaka months ago. 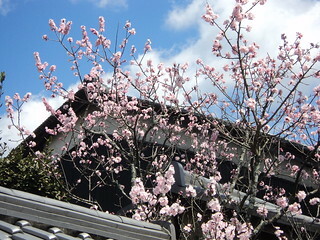 My friends said I would have no chance booking something this late and so close to Sakura (cherry blossom) season. Well I did and I’m sitting now in a nice hotel, taking a break from sight-seeing to write this post. It hasn’t all been carrots and potatoes though. We left for Osaka on Monday. The previous day we had activated Kate’s rail pass and booked our tickets. We were leaving on the 10:22 am Shinkansen (bullet train) from Shin-Yokohama. I had planned a bit of extra time to get from my house to Shin-Yokohama as it isn’t a route I would normally take and I have gotten lost on the way there before. On top of that, Kate had lost a lot of confidence in my ability to lead our travels when Sunday’s trip to Kamakura ended up in Tokyo which is entirely the wrong direction! Kate is still hoping to visit the picturesque village of Kamakura some time in the future. On this journey, I was determined to regain some of the respect I’d lost. I had planned a route that would involve one bus and then a train to get us to Shin-Yokohama. Unfortunately, we over shot on the bus and missed the stop for the transfer to the train on the blue line. We got off on the next stop and then walked the rest of the way to Yokohama station to transfer there. Thanks to my good planning though (I had included a time buffer), we were still on track to make the train. On arrival at the station, Kate stopped short in her tracks. 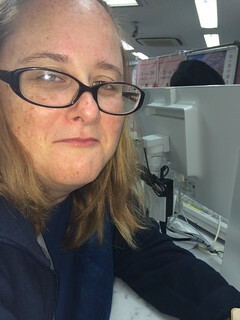 The face of despair when Kate remembered she’d forgotten her Japan Rail Pass. “I’m just having a panic attack that I’ve left my rail pass at home,” she said. It turned out that her panic was well founded. We changed our reservation for the Shinkansen to a later time and went all the way home to pick up her rail pass! In actual fact, this was helpful for me as I had forgotten to pack my iPhone charger, my camera and my hat. All of these I could have lived without but I had also forgotten a solo traveller’s best friend – my selfie stick! After reloading with all the stuff we’d forgotten, we headed back towards Shin-Yokohama and finally boarded the Shinkansen with just a two hour delay from our original plan. Once on the train, I settled in to a false sense of confidence that we would be right from here on in. This was shattered when I knocked my drink over and I watched as the movement of the train caused the liquid to run down the aisle. I tried wiping it up with toilet paper from the loo but there was just too much liquid and not enough paper. This also left little bits of toilet paper stuck to the floor all around me so even new passengers arriving could tell I was the culprit! On arriving in Osaka, we found our hotel and I congratulated myself on a good choice. It is in an excellent location and there is free wifi everywhere. When we got to our room though, we were a bit disappointed. It reeks of cigarette smoke and the one bed for the two of us is snug to say the least! Hence I’m currently sitting in the lobby writing this whilst Kate is upstairs sleeping. We are using the bed in shifts! 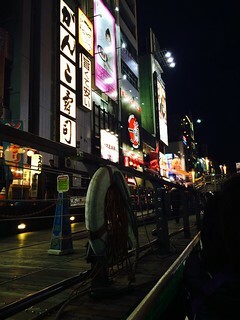 Last night, we walked to the river area for dinner and found that it is much colder in Osaka than in Yokohama. I hadn’t brought any warm clothing. I had a jumper on and a pair of light spring pants. Kate was also without any warm layers to put under her fleece. And to add to her problems, she noticed that the only two pairs of pants she had with her had blowouts in the inner thigh area making walking a risky adventure. On the way to dinner, we managed to find a cheap beanie for Kate and a couple of cheap extra layers for me but we knew we were going to be in trouble. 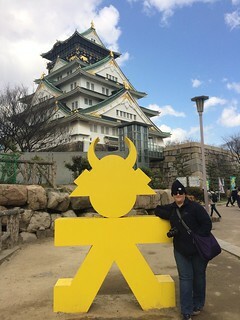 Today we decided to walk around the parks and Osaka Castle but it was bitterly cold. We bought extra gloves and scarves to help but we knew we were defeated when it started to sleet as we made our way to lunch. Actual ice was falling on us. Kate was not happy by the time we finally found the ramen restaurant we were looking for and sat down. She ordered a coke, only for it to arrive in a super-chilled tankard. She had to keep her gloves on to drink it. We have now completed our trip and are are back home. We are both snug and cozy in our dressing gowns, relaxing in my warm and comfy apartment. We need this. The final two days didn’t go much better than the first two. On Wednesday we decided to take a day trip to Nara which is just an hour away from Osaka. At one of the first temples we visited, there was an opportunity to get a paper with your fortune on it. Kate decided it was a bargain to have the rest of her life mapped out for her for just ¥100 so she picked a fortune. It was uncanny! And a really positive fortune too! Based on the test sample of one, I decided that this must really work so I too parted with ¥100 and picked a fortune. Mine was not so positive. There was a message saying that you could improve your fortune by tying it to the tree. When I tried this, the paper ripped in two. At this point, I should have taken the cosmic hint and insisted we went home but instead, we ventured further into the park. 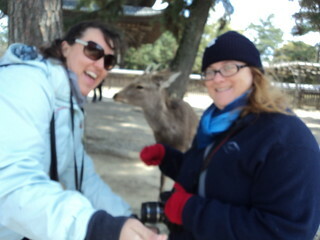 In Nara Park, I was continually terrorised by the ferocious deer that are all around. At first they look harmless. Children are petting them. There are people everywhere selling deer biscuits so you can feed them. The deer aren’t trying to eat the deer biscuits in their neat stacks by the sellers. This fools you into thinking the deer are docile creatures. I bought a packet of the biscuits and immediately the seller barked at me, “walk”! I hesitated a moment because I didn’t quite understand her but it was already too late. I was surrounded. Deer were coming at me from every direction. I managed to get a couple of biscuits out of the loose binding to feed to individual deers before I was just overwhelmed. I couldn’t get the biscuits out quick enough. In the end I gave up and threw them into the pack and fled! For the rest of the afternoon, deer would sidle up to me without me knowing and attack me at the last minute. One terrified me when it tried to eat the map I was studying. Another came up behind me and menacingly removed my temple ticket from my back pocket and ate it. I was glad to finally head back to Osaka. I’m so terrified, I couldn’t keep the selfie stick still! It wasn’t a simple trip back however. We boarded a train we thought ended at Namba (the station closest to our hotel) but when we reached Osaka central station, we realised we’d completely missed it. We then continued to board the wrong train again and again, until after taking no less than six separate trains, we finally made it back to Namba. Yesterday we left Osaka for Mirajima Island off Hiroshima. We had both visited the island before but I had thought that it would be nice to stay overnight and experience the island when the day trippers had left. Wrong! We discovered that the reason why people only go for the day is because everything shuts at six. And I mean everything. There was only one restaurant open for dinner and it was under quite a bit of pressure to accommodate the other hapless tourists who were also marooned there for the night. And of course, there was the deer. These ones aren’t fed but they are still pretty inquisitive towards anything you might be holding that’s made of paper. Kate couldn’t find a bin for the paper bag her snack came in but it didn’t matter because a deer took care of it for her. We also made one other discovery worth noting. Thanks to Ylvis, we all now know the answer to the question, what does the fox say? And thanks to our careful observations, we are pleased to report that we can now answer the next driving question. What does the deer say? They really do sound like that. That toy was uncanny and fully worth the ¥500 Kate paid for it! Today we left Mirajima with plans of walking around the Peace Park before boarding our two o’clock Shinkansen back to Yokohama but we got potteried along the way and ran out of time. When we got home, my apartment was as we left it as my cleaner had called in sick – dirty dishes in the sink, a pumpkin that had liquified in the kitchen bin and the only other clothes Kate had with her, still unlaundered in the basket. So we ended our trip with a few household chores. Tomorrow, I’m going to take another crack at getting Kate to Kamakura.